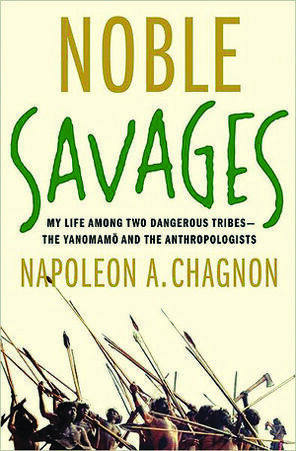 I admit this is a pretty old topic for a blog called Anthropology Now – but I’m just getting around to reading Napoleon Chagnon’s memoir Noble Savages: My Life Among Two Dangerous Tribes – The Yanomamö and the Anthropologists. Since I’m a member of one of those tribes (not the Yanomamö), I feel like I should read it. I have a generally positive view of Chagnon and his work among the Yanomamö of Venezuela and Brazil. His classic ethnography Yanomamö: The Fierce People, first published in 1968, is currently available in a “Legacy Sixth Edition” and is still frequently assigned in cultural anthropology classes. Also, if there is such a thing as an anthropological spectrum, I tend to be toward Chagnon’s end of it. But he is not without his detractors (a recent article by Alan Goodman makes some valid points and one by Barbara J. King does an exceptional job of explaining the issues without taking sides). The 2000 book Darkness in El Dorado: How Scientists and Journalists Devastated the Amazon by Patrick Tierney was highly (some would say “sensationally”) critical of Chagnon and others and their interactions with Native Amazonians. However, the central claims of Tierney’s book have been pretty well debunked. And then there was science!